Hi Friend, do you worried about your cellphone when you are in water sports like swimming, boating, kayaking, sailing, rafting, hiking, fishing and beach? Yes, you need a universal cellphone dry bag. Our WaterHigh Waterproof Cellphone Case just works on it. 1. Please conduct a safety test before using this waterproof phone case. 2. Cellphone may suffer hydraulic pressure under certain water depth, which will impact the operation of touchscreen. Please take photos by volume buttons in this case. 3. ID fingerprint working under the water: Wake up your phone by power button, then use "Raise to Wake" function: Setting -> Display & Brightness -> Raise to wake -> On. 4. During use, please avoid strong impacts and scratches. Do not use it permanently under high temperatures. 5. After using in water, if you need to remove the phone, please put the seal lock down, dry the remaining water and then remove the phone. 6. Suitable for use under 45 degrees Celsius temperature. 1. IPX8 Certificated - Fully submersible and waterproof, offers waterproof, sandproof , dirtproof, snowproof protection for your devices. 2. 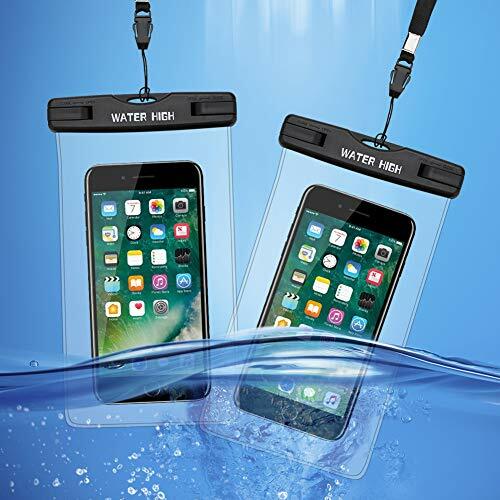 Universality - WaterHigh Waterproof Phone Case fits all large smartphones below 6 inches & your cash, documents, credit cards, very good for indoor & outdoor activities, water sports, and travels. 3. Share Joy & Happiness - WaterHigh Waterproof Phone Pouch has clear windows on both front and back sides, perfect for taking photos, videos and chatting with friends when you are in water sports.